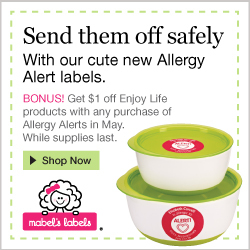 May is National Asthma and Allergy Awareness Month and Mabel's Labels has launched their newly re-designed Allergy Alert Labels. These labels are a must-have to help make sure that your family is eating safely. Allergy Alerts are durable, waterproof labels that specify allergies on items such as lunch boxes, water bottles, travel gear and much more!